People iHelicopters is specializing in the manufacture of toys that can be controlled via the iPhone. A few weeks ago we brought you the iUFO analysis or the insect with which we could spend the odd joke but the product that we show in this post, is one that most drew our attention. Py iS is Tank, a land vehicle that incorporates a spy camera to transmit it to record the screen of your iPhone or iPad, provided real-time. To achieve this, iHelicopters people have been forced to abandon the classical IRDA connection and go for LAN, thus achieving much greater scope to handle the toy (20 to 30 meters) and a bandwidth large to transmit video. All these extra options also directly affect the battery needed to power the iSpy Tank. A total of six AA batteries are required to enjoy this toy so it is advisable to get with a rechargeable. As always, you need to install an application on the App Store to handle the toy. It will have all the options to handle the Tank iSpy, record video or take pictures. The regular price is $ 119 Tank iSpy but is currently on sale for only $ 99. 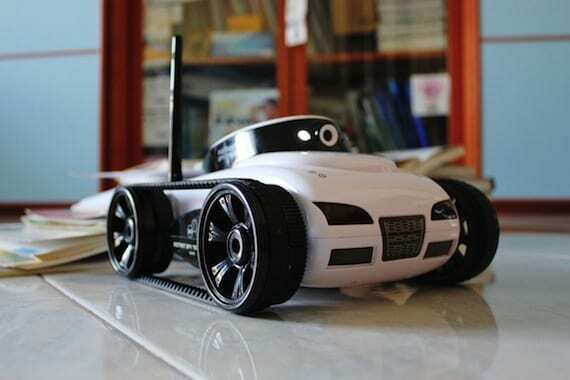 Article iSpy Tank, another iPhone-controlled toy that incorporates a spy camera was originally published in News iPhone .